As of this morning, Amonkhet is fully spoiled! I’ve already written at length on As Foretold and Gideon of the Trials, which jump out to me as the two best cards in the set (with As Foretold leading by a substantial margin). For more on those two, check out my article from last week. Today’s focuses on the slightly-less-exciting Amonkhet cards I think are still likely to see Modern play in some capacity, and on the duds getting attention anyway. Besides As Foretold and Gideon of the Trials, Amonkhet‘s Modern playables will probably slot into existing archetypes. Vizier evokes Courser of Kruphix, a more defensively-slanted creature with a similar ability for lands. A couple of factors have me thinking Vizier might make it in Modern despite its higher casting cost. For one, there’s no limit to the amount of creatures we can play per turn, so Vizier can possibly draw us more than one card on the same turn. Courser caps out at one extra card per turn, barring the presence of some goofy effect like Azusa, Lost but Seeking‘s. Creature-heavy decks in the market for some card advantage, like Bant Eldrazi or any Genesis Wave-style deck, might be able to employ Vizier profitably. Second, improving the creature’s power by one point goes a long way in terms of playability. Sturdy creatures like Courser and Vizier excel in role-shifting midrange strategies like Todd Stevens’s GW Company deck from last month. Having three power instead of four is a a great boon to Vizier in similar archetypes, which need their cards to switch between aggressive and defensive roles at will (explaining Tarmogoyf‘s ever-crucial role in Modern midrange decks). Vizier also has two abilities I think will be overlooked at first, but start to add up as the card sees more play. That it hides the top card of its owner’s library from their opponent is great for longer games. One deterrent to running Courser of Kruphix in traditional BGx shells is the information it leaks to the other side of the table. The Cleric’s other sleeper function is its ability to act as Oath of Nissa for creature spells by filtering mana. I doubt this ability generates decklists on its own (unlike Oath’s, although I would love to see Vizier in a revamped Domri Obliterator list), but it’s far from irrelevant. It gives Abzan Company a way to cast its creatures under Blood Moon, or color-intensive threats like Voice of Resurgence with utility lands like Gavony Township, for instance. Weird colors, weird abilities, weird casting cost. Fortunately for Nissa, Modern is a weird format. Her ability to scale in long games makes Nissa very interesting, despite her inability to protect herself. The decks that will try her out are ones that tend to have lots of lands in the mid-game and struggle with consistency issues—again, Bant Eldrazi springs to mind. It helps that her 0 ability works best in decks full of lands and creatures, but light on noncreature spells. I could see Nissa working in some ramp-happy creature deck that also wants Vizier. I was hoping none of these hideous aftermath cards would be Modern-playable, but Cut // Ribbons is too juicy for me to ignore. Cut leaves a little to be desired. Modern already has this effect for one mana in Flame Slash. Luckily, the spell’s flashback mode is a game-winner. Ribbons domes opponents for X, only costing pilots an extra BB. That’s exactly the kind of mode Removal.dec wants on its binned cards. Grixis Control has all but inherited UR Twin’s title as Bolt-Snap-Bolt deck of the format, and Ribbons meshes perfectly with that gameplan. Considering Twin, Blue Moon, and other black-less blue-red decks ran Roast to deal with problematic creatures, Cut’s extra mana cost over Flame Slash doesn’t seem like a deal-breaker. The main concern is whether players will want it over Terminate. Fatal Push and Lightning Bolt already handle early creatures admirably, so Cut just lightens the load there. Later on, Cut addresses Thought-Knot Seer, Hooting Mandrills, and Restoration Angel, but notably misses Tasigur, the Golden Fang and Reality Smasher. It’s possible BRx mages will need their two-cost removal spells to hit these creatures if they’re going to sleeve them up alongside Push and Bolt. 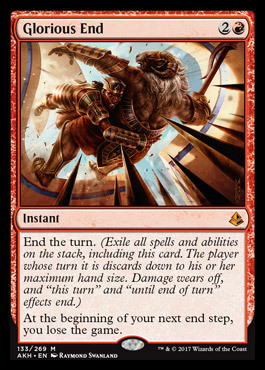 But if not, Cut // Ribbons seems like an exciting complement to midrange strategies in those colors. Either way, I doubt it rises above one copy per list. Here’s the most boring of the spoiled cards covered today, but Cast Out nevertheless deserves a mention. 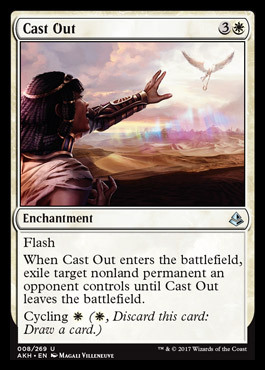 The main reason to play Cast Out over Oblivion Ring (or, alternatively, Detention Sphere) is its flash keyword. Flash makes Cast Out more attractive for hyper-reactive decks like Esper Control. It also increases the card’s cost, and the jump from three to four mana makes the cycling add-on a lot better. In the early-game against aggressive decks, having the option to ditch an O-Ring effect for a shot at drawing Supreme Verdict gives the card some welcomed flexibility. Well, it ain’t Counterspell. But Censor has some makings of a Modern-playable card regardless. To explore Censor’s role in Modern, we’ll have to understand Mana Leak‘s two shortcomings. First, Leak loses value in longer games. When opponents have seven lands, it gets really tough to counter their Fatal Push with Mana Leak. Leak then generates a unique tension in Modern control decks, which by their very nature strive to bring the game to a state in which Leak ceases to counter anything. Second, Leak shines when it trades up on mana with enemy spells. In other words, it needs to counter spells that cost three or more to put casters ahead on tempo. Since Modern is so full of aggressive and linear decks, it’s rare that Leak properly executes this function. If it’s just going to hit Goblin Guide or Tarmogoyf, it might as well be a one-mana spell like Fatal Push. Censor addresses both of these issues, at least to a degree. In longer games, it can simply be cycled away for something else. This second mode would have been incredible on Mana Leak, but it’s less impressive here, as Censor is likely to lose in-game value much quicker than the Stronghold staple. Opponents only need to wait one turn to play around Censor, compared with three for Leak. Decks like Tron and Ad Nauseam, then, will have a much better time laughing it off. As for trading up on mana, Censor still does that. Some of Leak’s juiciest targets include Collected Company, Chord of Calling, Liliana of the Veil—Censor will always counter these spells on-curve, which is when they’re most likely to pose problems (or even be cast). In decks that put on enough pressure to keep Leak live the whole game, like Temur Delver, Censor seems pretty useless. But decks that want a two-mana permission spell and struggle to deal with Leak’s downside in longer games, or ones that shift gears at some point to no longer need countermagic, should give it a try. Pull is probably the worst of this bunch. This card would have been awesome for UR Twin, but with that deck dead and gone, it mostly just lacks a home. The blue decks that do want a “draw X” effect don’t mind splashing white for Sphinx’s Revelation, which has lots of upside over Pull in its text box alone. White also gives control mages Path to Exile and Condemn, which are premier removal spells in Modern this season. Trevor alluded this week to Pull being played in Scapeshift, but I don’t see the Temur versions of that deck putting up results anytime soon. RG variants are much more proactive, an asset impossible to overstate in Modern. Pull doesn’t solve that problem for green Cryptic Command decks. All that said, I’d be surprised if Pull didn’t find its way into a couple of Ux sideboards as a one-of. Grixis Control seems like the likeliest home for the card right now. Pull also opens up some deck design space for UB and Sultai, which just got their Bolt/Path analog in Fatal Push and can’t hate having a Sphinx’s Revelation analog too. A beautifully designed card with plenty of unintuitive interactions. Time Stop has never been a competitive staple due to its steep mana cost, but Glorious End might be cheap enough to actually make some waves in Modern. If it does, we’ll finally learn how to properly cast this kind of card! Of course, there’s also the drawback to worry about. Do we cast End on an opponent’s upkeep and then win next turn? Or after they alpha-strike us during a board stall so we can crack-back for lethal? Or in response to a key spell they’ve been waiting to resolve? Or in response to the “lose the game” trigger from our last End, to get one more chance at winning? All of these individual examples seem narrow and bad, but taken together, they present a good deal of flexibility. Add to that flexibility Glorious End’s interaction with cards like Angel’s Grace and Gideon of the Trials (and Sundial of the Infinite, as snubbed-Johnny-insurance), and we have ourselves a card that may see play in some interesting Modern decks. Where it goes: Who knows? I also want to touch on a couple cards I believe have generated unwarranted hype. Three mana for a bulky beater that doesn’t do anything without another bulky beater in play. That’s way too much to ask from a creature that dies to Path to Exile, Condemn, and Restore Balance without generating value. Burn’s creatures each represent 4+ damage. How much will Mentor realistically deal? What does Burn cut to make room? Are those cuts worth readjusting the curve to pull away from other two-drops, which happen to be the best cards in the deck? Of Modern’s non-Burn decks, only Zoo is aggressive enough to want Mentor, and they’re too focused on curving Emissaries into Bushwhackers to waste time even with Eidolon of the Great Revel. Before I go, I want to remind everyone that there are multiple ways to play Modern. It’s true that there’s often a best deck or three for a given event. But at the local level, many players just sleeve up what they have, what looks interesting, or what they’ve been tuning for years. Smaller tournaments like FNMs are ideal settings to grow as a deckbuilder by challenging yourself to build cohesive piles of, well, trash. This deck is awesome at brute-forcing other creature decks, and the hoser enchantments in the side win a lot of games on their own. 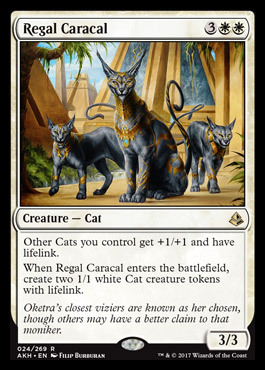 Regal Caracal’s whopping converted mana cost of 5 forces us into lots of lands, which luckily also supports two of Modern’s most aggressively-costed cats, Steppe Lynx and Scythe Tiger. Another blessing in disguise is Tarmogoyf‘s Lhurgoyf creature type. Later, pal—let’s run Rest in Peace instead! Modern’s deep card pool is a dream for brewers, and it only improves with each released expansion. Did I miss any standouts from Amonkhet? Have an Amonkhet-infused brew of your own to share? Hit me up in the comments. Also, what do you think about soul-scar made in delver as creature 13-14? It makes the deck faster against tron and combo (compared to young pyromancer or clique) and helps against eldrazi as well (another difficult MU) by turning on your burn spells. A swift spear that also plays defense (but attacks for 1-2 damage less, granted) strikes me as interesting at least. Finally, regarding the comparison between pull from tomorrow and rev, isn’t a loot better than lifegain most of the time? Censor isn’t ideal for Grixis Delver, a deck that applies enough pressure to largely ignore Leak’s drawback of being dead late. Soul-Scar seems awful. It’s not just attacking for less than Swiftspear—it lacks haste! That’s significantly less damage. If you want to beat Eldrazi, play Terminates. As for Pull, this kind of effect is usually played in decks that spend their early game trying not to lose. I’d wager the lifegain on Rev is more important than the loot for them, lest opponents just burn them out once they’ve stabilized the board. By the same logic, Delver may also apply enough pressure to keep censor live as well? Regarding Swiftspear, remember that we are talking about grixis delver, a deck that isn’t that interested in the 1-2 damage the haste represents. Soul-scar mage is obviously a worse attacker than swiftspear (on an empty board), but it plays defence so much better. Also note the even if you pack terminates instead of pushes, your MU against eldrazi is really difficult. Censor becomes dead a lot faster than Leak does, which makes it more attractive for decks that are likelier to bring games to a state wherein Leak is dead. If Leak is usually live in Delver, there’s no reason to play Censor there. If we’re talking about Grixis Delver, we shouldn’t be considering creatures that don’t apply cheap, evasive pressure, serious bulk, or value at all. I seriously doubt SSM sees any play in this deck. Yes, censor becomes dead a lot faster than leaks does, nice call. However, leak does not always turn into a cantrip when you need it and pay 1 is often as good as pay 3 in early turns. The real issue is that censor does a worse job at protecting your queen against 1 cmc removal. Well, SSM does obviously hit the cheap and value criterion for your so I guess you should consider it by your rational. It is likely not be good enough, but it is at least interesting. I disagree with your premise that pay 1 is nearly as good as pay 3 in the early turns. It’s far easier to stop an early Bolt or Path with Leak than it is to do so with Censor. SSM does not provide enough damage for the cheap criterion (or evasion/bulk, which is really important to this kind of deck) or generate value, which is why it’s not good enough. I’ll give you interesting, though! I fail to see how soul scar mage is a worse attacker on an empty board/ is attacking for less than swiftspear when disregarding haste. They both have prowess and are 1/2 so we are basically deciding if wither burn is better than haste. I personally see wither burn as negligible a lot, but it helps against eldrazi tron, death shadow, and other bg decks with goyf. When disregarding haste, you’re right, they attack for the same amount. I’m not going to just ignore that Swiftspear has one of the most powerful combat keywords in Magic though. Bone Picker is awful IMO—try it and you’ll see that the setup is way too steep for such a lousy payoff. Casting Picker on turn two after killing an opposing creature only works against decks with little creatures. Picker is just dead against stuff like Tron and Ad Nauseam, which are the matchups you’d want a one-mana 3/2 in anyway. Biggest trap of the set! 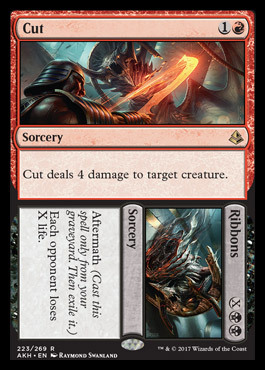 As a Mardu player I am intrigued by cut//ribbons. Mardu has tradionally had trouble closing the game compared to BG counterparts. This spell could allow it to finish games quickly. I would run like 1-2. I am surprised that you didnt mention Bone Picker once. A 1 mana 3/2 with flying and deathtouch is the best case scenario, but delver has proven that a 3/2 flying body is often worthwhile. For decks running a decent amount of lightning bolt and fatal push, casting this turn 2 should be easy. The only flaw of this would be decks lacking early creatures. Perhaps too slow, but I thought it was worth a mention. I think Vizier’s problem will always be “why aren’t you just playing collected company instead?” You could technically play them together, but company decks have very little space for cards that company doesnt hit. I think its usually around 8 total, and usually 4 of them are path to exile. Cut to Ribbons… how is ribbons good? If you’re a deck that is at all interested in having lots of mana with nothing to do with it play some manlands? I can’t see too many modern games turned by tapping out for a one shot 4 damage to the face, and if they were I’d still probably be running tar pit, ravine, or even lavaclaw reaches first. Roast and Flame Slash don’t really get played anymore as far as I can tell, let alone a worse version. As for missed cards – I think desert cerodon probably replaces deadshot minotaur in living end? 6/4 instead of 3/4 and won’t randomly zap your own faerie macabres. And if anyone was still playing jungle weaver greater sandwurm might be an upgrade (no reach but better at connecting for dmg). No hope for cycling lands? Probably too slow to ignite some new life from the loam engine but I could still imagine it kind-of working? And last one I’d note is the vulture. B for 3/2 flying deathtouch is pretty solid. I don’t know what deck wants this but I would imagine some kind of liliana of the veil + fatal push control deck of which there are many variations. May still be too lousy too often, but theres some potential. Agree totally on the harsh mentor. At first I thought it looked great, then tried to think of where it goes. One note for zoo – you can’t cast an eidolon off a burning tree, you could cast this. Also the effect is not symmetrical so it doesnt have the same deckbuilding constraints of suppression field. Vizier is better in decks that have creatures that cost 4 or more mana, like Bant Eldrazi. Can’t CoCo into those. I think it’s also an attractive Chord target and can see a single copy making the 75 of some CoCo lists, perhaps alongside Tireless Tracker for more help against grindy decks. Having access to an “X damage” spell for free (assuming Cut did something) gives players inevitability. It makes enemy decisions a lot harder when it comes to killing pesky Snaps or leaving up mana to answer a Tar Pit in the same way Conflagrate did for Dredge. They have to remember and respect the Ribbons in the grave. I’m feeling less optimistic about Cut, though—that half is really bad. Wish Ribbons gained life, too. Good call on the cycling creatures; I forgot about Living End. They will definitely make these changes. Cycling lands are slow and bad. Vulture looked awesome to me too at first, but it’s a little too narrow for Modern. Cheap, evasive beaters in spell-based interactive decks are best used to pressure linear opponents early, and those decks don’t always have removal targets or care about removing threats themselves (Tron, Ad Nauseam, Grishoalbrand, etc.). It’s a pseudo-Delver that doesn’t do Delver’s main job very well. In matchups with lots of creatures to kill, something like Snapcaster is already better than Vulture. Right, and when you just want a 1 cmc black threat for the mid-late game in control you would just run tasigur/angler which are way easier to reduce reliably than vulture, and dont die to decay+bolt+push. Makes sense – vulture falls in no mans land. It’s bad at being a delver and bad at being a tasigur. I’ve seen some people speculating about Vizier of Remedies as an option in abzan company to combo with persist creatures and/or devoted druid. Do you have any particular opinions on it? Fine as additional copies of Melira/Anafenza, but I don’t think that’s what these decks are really after right now. Still, Vizier or Remedies slipped past me and I think it’s possible the card sees Modern play in that kind of deck. Do you see Nissa Steward of Elements making Tron? Doesn’t keep them alive, so no. Is nobody going to even mention Blazing Volley? Sure, it’s not flashy, but it’s a sideboard card that answers Lingering Souls fairly cleanly and also kills half or more of Affinity for 1 mana. Way less flexible than what you get for two mana (Clasm). Even Forked Bolt is more dynamic at the same cost. Bolt won’t kill four tokens, but it will kill two, and Volley won’t ever kill a new Scooze. Versatility commands a premium in Modern; this card won’t see play. What about bone picker? I honestly feel like it could help out decks like mardu a good amount. It would make bob harder to run. you would probably have to run soulfire grand masters and lightning helix to negate the 4 cost of the black delver. just a thought.